Groupama 4 led the fleet around Cape Reinga at 1754 UTC today and is now on the home strait with just 176 nautical miles remaining to the Volvo Ocean Race leg port of Auckland, New Zealand, while the battle for second and third place has gone into overdrive with just five nautical miles separating the next three boats which are 100nm behind the leader. The final stretch includes a beat down to Cape Brett, where the French team will crack sheets and power reach towards the finish of what has been an epic leg from Sanya in China to Auckland. With victory all but secured for Franck Cammas’ team, the battle for second has intensified. 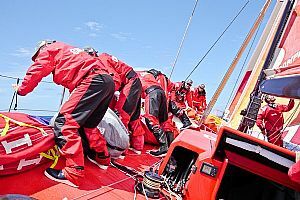 Camper with Emirates Team New Zealand tacked onto starboard at 1640 UTC, in a bid to cross ahead of Puma Ocean Racing powered by Berg and Team Telefónica, which was on a perfect lay line for the Cape. Just before 1900 UTC, Camper tacked back again and dropped 18nm and two places to fourth. The team is now 11nm to leeward of Telefónica, while Puma is 2.78 nm to windward. It is possible that all three which are only five nautical miles apart, will have to tack again to clear the Cape. Groupama is half way across Great Exhibition Bay and preparing to make her decent towards the Hauraki Gulf. Abu Dhabi Ocean Racing (Ian Walker/GBR), which is 40nm behind Camper, leads Team Sanya (Mike Sanderson/NZL) by 20nm. Both teams are sailing the same course as Puma and Telefónica towards Cape Reinga. Groupama 4 is expected to cross the finish line at around 1100 UTC today, March 10, with the next boat tipped to finish at around 0100 UTC March 11. Abu Dhabi Ocean Racing and Team Sanya are expected two hours later.